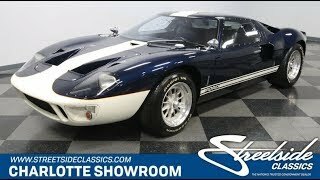 Hi, I am interested in your 1967 Ford GT40 (stock #5076-CHA) listed on Autotrader for $114,995. I'd like to get more information about this vehicle and confirm its availability. While every factory Ford GT40 is special, some are more special than others. The dazzling example featured here, chassis GT40P/1074, earns bonus points for at least three reasons.. The legend around the Ford GT40 is arguably the biggest in racing history. Now, a company called Superformance offers a (slightly) cheaper GT40 experience. Built for both the road and the racetrack, this 1967 Ford GT40 replica is a full performance build right down to the Holman Moody components in the V8. So dig into all the details on a sleek retro machine that will make your favorite roads feel like Le Mans. If you know about ERA replicas, then you know they take the time to make a cut-above product. In fact, the GT program was one of their most difficult. They put so much time and quality into their product that it was hard for them to sell it at a profitable price. So its likely less than 80 were made before they pulled the plug on the program, and this is one of those few. ERAs idea was to create a straight and sturdy fiberglass body thats faithful to the original. The shark-like nose with cooling vents diving deep into the hood; the doors that cut into the roof; the rear window where you can clearly see the V8; the ducktail spoiler that extends the flat-panel rear; and two tailpipes bold sitting in the exact middle of it all... This is everything you love about a GT40. The blue paint still has the kind of slippery gloss that reminds you how aerodynamic the design truly is. Plus, the white is used for Fords famous rocker stripes. And the white on the hood and roof is even more distinctive with red and yellow pinstriping used for a dividing line. The whole look has an authentic race-ready attitude, right down to the Halibrand-style wheels with genuine knock-off hubs. The interior looks race-ready, too, but its actually more secretly rewarding. For example, you have proper weather sealing, plush carpeting, and even provisions for air conditioning. The leather bucket seats have the classic competition look, but they are also nicely bolstered for better comfort. Of course, the racing harnesses, fire extinguisher, reverse lockout, and releasable steering wheel are nice reminders that this is a true track machine. The full dash is laid out with clearly labeled toggle switches and easy-to-read Stewart Warner gauges with the all-important tack in front of the driver. One look behind the seat, and you know youre getting proper power. Thats a 302 cubic-inch V8 thats believed to be built with several Holman Moody parts. The valve covers and intake are true Holman Moody components. This is a performance build with a four-barrel carburetor, Edelbrock fuel pump, Mallory ignition, aluminum radiator w/dual fans, and the proper bundle of snakes headers that directs their rumble right out of the rear center. You have complete control over this powerhouse and its soundtrack thanks to the ZF five-speed speed transaxle. The full chassis is part of a strong custom-made semi-monocoque (just like the original GT40). And it is a true race-ready handler, too, with a double wishbone front suspension, fully independent rear, adjustable coilovers, Eibach springs, rack & pinion steering, and four-wheel disc brakes. When you get an awesome mix of power and poise, you know youve found a car thats worth the extra attention this will attract. Dont miss out on this rare and speedy machine. Call now!